I relay because I have lost too many people to cancer and I want to eliminate this battle for future generations. My husband Jeff Jasnoch, my dad Don Kuchinka, grandparents and dear friends and relatives whose lives were lost to this disease, I relay for all of them. I honor my loved ones and fights this battle in their memory, as well as for all who struggle with cancer now. Please help us to eliminate this disease. I Relay because I want to eliminate cancer during my lifetime. Relay gives me the unique opportunity to celebrate the lives of those who have battled cancer, remember loved ones lost, and support the American Cancer Society’s lifesaving mission by fighting back against a disease that has already taken too much. The pancake breakfast will run from 8:30 am – 12:30 pm and is being put on by our Relay for Life team from Northfield, “The Builders”. Our team consists of a dozen people who have been affected by cancer either their self, or have had a relative or friend affected by cancer. We will be participating in the American Cancer Society’s Relay for Life for Rice County on August 6th and will be fundraising up until the event in order to meet our team goal of $5000 for this years event. Our team was the 2nd largest fundraiser at last year’s Rice County Relay for Life event, far exceeding our goal and raising over $7200.00. We also had the top Rice County individual fundraiser, Kathy Jasnoch, on our team as well. The Rice County Relay For Life event raised over $114,000.00 last year. Please help us to meet our goal again this year by attending the pancake breakfast on Sunday. Cost is $6 for adults and $3 for children 8 and younger. Cancer has taken too much from me, and I am sure it has taken too much from others as well. I will be doing what I can to help fight back! If it means flipping pancakes (and eating a few in the process), that’s the least I can do! I hope that others reading this are also willing/able to help out. I have been a member of The Builders Relay for Life team for seven years. The team started as a small group of family members coming together to support a relative battling cancer. Unfortunately, he lost his battle with cancer and now we relay in his honor. The team has since grown to a larger group of family, friends and co-workers. We all come together to support, honor and remember those affected by cancer. At some point in our lives, we will each be touched by cancer. It’s my hope that a cure will be developed in my life time. I participate in the Relay for Life event to help raise funds towards finding the cure. 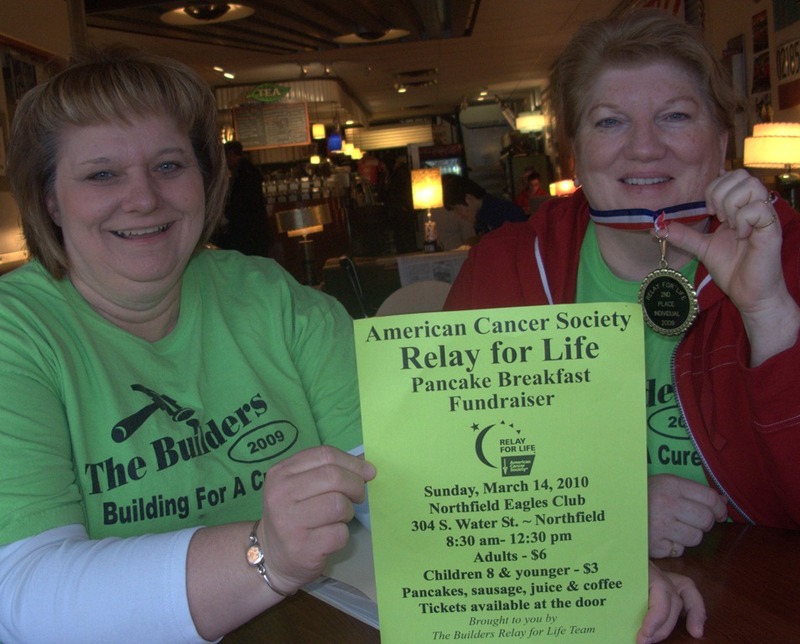 Please support The Builders Relay for Life team and the American Cancer Society by joining us for breakfast on Sunday, March 14th at the Northfield Eagles Club. Breakfast will be served from 8:30 am -12:30 pm. We appreciate your support!! You will lose an hour of sleep tonite but our Relay for Life team has a great way to help you wake up tomorrow morning. Pancakes and Sausage and juice and of course COFFEE will be served from 830 am to 1230 pm at the Eagles Club in Northfield!! COME AND JOIN US TO RAISE MONEY IN SUPPORT OF CANCER RESEARCH!! We have the best breakfast and the best team in town! Hope to see you there. Aaron and Tara, thanks for chiming in here. I hope to meet you both this morning. I’m hungry!